I’m giving this 2 stars as it is only short samples of each song. I bought this on the Amazon mobile app where the song length is not displayed. The songs are beautiful but I wanted the entire songs. 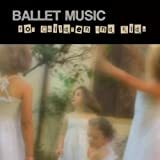 This is a nice mix of popular kids songs – all piano, so very nice for a calm ballet class. The students like it – sometimes they sing along while they’re dancing. My only complaint is that the songs are very short, so I’m re-burning the CD to put each song twice, back to back.